Now that you've had a taste of treasure hunting, are you ready to discover the road to and from adventure? Enter Thunder Rift and you'll find the excitement that lies outside the dungeon. From the Plunging Cataract Falls to the Keep of the Black Knight, the Rift offers a miniature world filled with friends and foes alike. Thunder Rift offers the novice Dungeon Master a rich environment in which to begin a campaign. He or she can run the companion modules designed for use with this accessory or create entirely original scenarios that only require a place to be played out. There are lots of adventure ideas built right into the text, and lots of space for inventive DMs to "do their own thing." Player characters will find the Rift to be an excellent home turf, and they can get to know the valley while they are getting to know their characters and the game. Comes with a large, colorful map sheet Acts as a setting for numerous TSR adventure modules, but remains completely self-contained, a perfect setting for any adventure Thunder Rift can be placed into any world in which the DM sets the campaign. 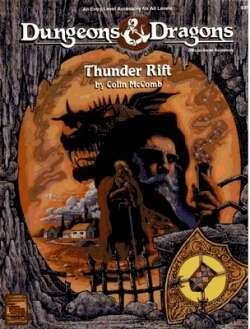 "Thunder Rift" (1992), by Colin McComb, is the sourcebook for the Thunder Rift mini-campaign. It was published in May 1992. Origins (I): An Introductory Setting. In the early '90s, different design groups at TSR were in charge of writing about different games and different settings. Responsibility for Basic D&D fell to Bruce Heard's group, so when Colin McComb was briefly a member of that group, he was asked to design Thunder Rift. Thunder Rift was to be the setting for the adventures and "adventure packs" produced for The New Easy-to-Master Dungeons & Dragons Game (1991), which was commonly called black box D&D game. McComb's directives from Heard were simple: Thunder Rift was to be "accessible" and "droppable anywhere". In addition, there had to be room for "lots of adventures". Based on the name and these demands, McComb decided to create a setting bounded by impassable mountains. Origins (II): Back to Basics. Thunder Rift was a rather unique product line for TSR in the early '90s. At the time, the company was producing increasingly unique settings like Spelljammer (1989), Ravenloft: Realm of Terror (1990), and Dark Sun (1991). The game's old-school settings were being deemphasized or else transformed by wars or by the discovery of new, less Medieval lands. "Thunder Rift" was thus a return to the classic ideals of D&D's birth. "In the D&D Game Box, PCs simply arrive at their destination after traveling through an undescribed void." The only terrain that players encounter when using the basic rules is that of a dungeon." In other words, "Thunder Rift" was the first chance for a whole new generation of D&D players to explore the wilderness. "Thunder Rift" is largely a gazetteer that describes the various lands of the Rift. It puts most of its focus on the Rift's civilized settlements, but also gives some attention to a variety of natural marshes, hills, swamps, and woods. If GMs want to develop this supplement's short notes into a complete sandbox, they'll have some work to do, but "Thunder Rift" offers a foundation. Exploring Thunder Rift. "Thunder Rift" is the supplement that thoroughly details the mini-campaign-setting of the Rift. It covers the many settlements of the area, with special attention paid to the city of Melinir. "Thunder Rift" also incorporates the previous adventures "Quest for the Silver Sword" (1992) and "Assault on Raven's Ruins" (1992) into the setting by referencing the towns of Torlynn and Kleine (as well as the eponymous Raven's Ruins). However the adventures in the black box and its first adventure pack, The Dragon's Den (1992), are both missing from the new setting. Exploring Mystara. Though Thunder Rift was made to be dropped into any setting, both editor Andrew Steven Harris and author Colin McComb say that it was always intended to be part of the world of Mystara. Harris envisions it as lying on some other continent, while McComb sees it as being somewhere closer to home, perhaps in the mountains of Karameikos. Whoops! (I): A River Runs Through It. The rivers of "Thunder Rift" rather infamously disobey the laws of gravity, going in all kinds of wacky directions. Fans have suggested underground outflows and magical interference as explanations for some of the Rift's water problems. Whoops! (II): AD&Disms. The NPCs of "Thunder Rift" are written using AD&D classes, not D&D — meaning that they have both races and classes, rather than racial classes like "halfling" and "dwarf". McComb says that he thinks the editor incorrectly changed his Basic D&D classes to AD&D 2e classes. Whoever did it, this reflects a general problem at TSR in the early '90s, where most of the in-house designers, developers, and editors weren't that familiar with the Basic D&D game. About the Creators McComb was writing some of his earliest work for TSR in 1992, so creating a new (mini) setting was really a plumb assignment. He would later become better known for his work on the Planescape setting. This title was added to our catalog on August 16, 2016.